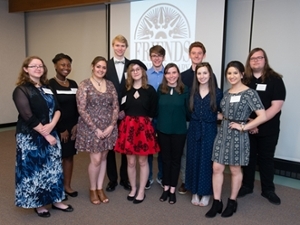 The Friends of Lovejoy Library honored 12 students at its 25th annual High School Writers’ Contest awards banquet Wednesday, April 10 in Southern Illinois University Edwardsville’s Morris University Center. During the past 25 years, approximately 300 area high school students have received awards in the categories of non-fiction, poetry and fiction. The cash awards, established to promote and recognize excellence in writing in southern Illinois high schools, are provided for first, second and third place. This year, 15 high schools accounted for 282 entries with Belleville West garnering the most awards (7) under the guidance of English teacher John Lodle. Timothy Staples, EdD, director of the Center for Student Diversity and Inclusion and interim executive director of the SIUE East St. Louis Center, was the featured speaker. Photo (L-R): Front row – Sierra Smallie, Randi Goodwin, Melissa Murphy, Kia Smidt, Erin Kelley, Kristin Kurtz and Ayah Hamdan. Back row – Connor Ruesink, Spencer Runzo, Sean Kulig and Ryan Stewart.